[PSVita] Rocks n Diamonds Vita v1.9 Released » Brewology - PS3 PSP WII XBOX - Homebrew News, Saved Games, Downloads, and More! rsn8887 has released Rocks n Diamonds Vita version 1.9 for the PSVita. - removed slow-down when playing levelsets that use the Emerald Mine engine with default graphics, such as the bundled Emerald Mine levelsets. These are my Vita ports of Rocks’n'Diamonds and Mirrormagic. 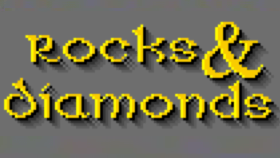 **Rocks’n'Diamonds** is a Boulderdash type game by Holger Schemel with many unique features, such as the ability to play remade levels from Boulderdash, Emerald Mine and Supaplex and many more levels. Thanks to my awesome supporters on Patreon, especially Andyways, CountDuckula, and Sean Ritzo. Thanks @FrangarCJ for help with optimizing the rendering. Thanks to Holger Schemel for making a great and portable game. Thanks to the many devs of VitaSDK for a great development environment. - extract contents of rocksndiamonds_data.zip and mirrormagic_data.zip and copy them to your Vita’s ux0:/data folder. You should have folders ux0:/data/rocksndiamonds and ux0:/data/mirrormagic on your Vita with the files in them. - Just download, unzip, and transfer to your Vita, so that you have a subfolder ux0:/data/rocksndiamonds/levels/More_Levels. - FTP transfer of levelsets has to be done using binary transfer mode, not Auto or ASCII . Otherwise some levels will be treated as ASCII with mangled line endings and won’t work. This was verified with the Emerald_Mine_Club_original_1 levels and FileZilla FTP. - To load new level sets, go to the level number selection in the menu, and press x. A new screen should open that shows a few levels. Go to the parent dir and into the folder Classic Games. There are many more levels already included in that folder. - Sometimes when loading a levelset after loading other level sets one after the other, the game runs out of memory and quits. This is fixed by simply restarting the game and loading the levelset again. - To answer the OK/Cancel dialogs in the game, press select to cancel (select is escape), or x for OK.
- You can install new level sets for Mirrormagic by copying them into ux0:/data/mirrormagic/levels. - For multiplayer team mode in Rocks’n'Diamonds to work on VitaTV, enable it via Setup->Game & Menu->Team-Mode (Multiplayer)->on. You also have to find make a level that has multiple players. r+square and r+triangle can be used in-game to change focus between players, see Game Controls. All controllers have to be paired before launching the app, otherwise they will not be recognized by the game. - removed slow-down when playing levelsets that use the Emerald Mine engine with default graphics. - optimized rendering for large speed improvement (1.5x), noticable mostly on the very fast game speed setting (thanks @FrangarCJ for the help). - Mirrormagic as separate app. It uses the same codebase as Rocks’n'Diamonds. - Smoother mouse pointer motion. - Significant speedup by drawing directly to texture pixels. Setting game speed to ‘very fast’ actually makes it faster now. - implemented mouse pointer controls via right analog stick and front touch. The level editor is fully usable now. - fixed name entry using touch keyboard. It works without any return or backspace keypresses now. Download Rocks n Diamonds Vita from the Brewology PSVita Store.